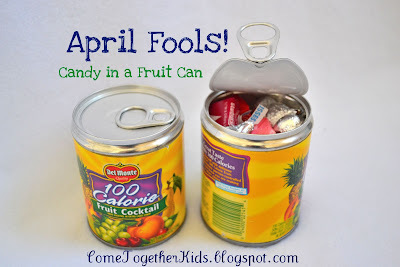 I know this is super last minute, but as I was packing up the kids' lunches for tomorrow, I decided I wanted to do a more nutritious prank to go along with their Candy in a Fruit Can. 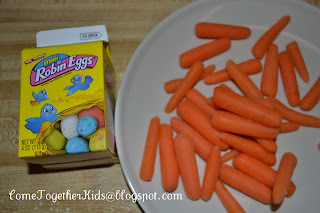 I had picked up some little candy cartons of malted Easter eggs for an upcoming project and decided they would be perfect to hide some baby carrots in. They came together super quickly, so if you have something similar in your pantry and fridge, you could pull off this prank in time too. All you need is a carton of candy, some baby carrots and a glue gun! Carefully open the flaps at the bottom of your carton and empty out the candies. 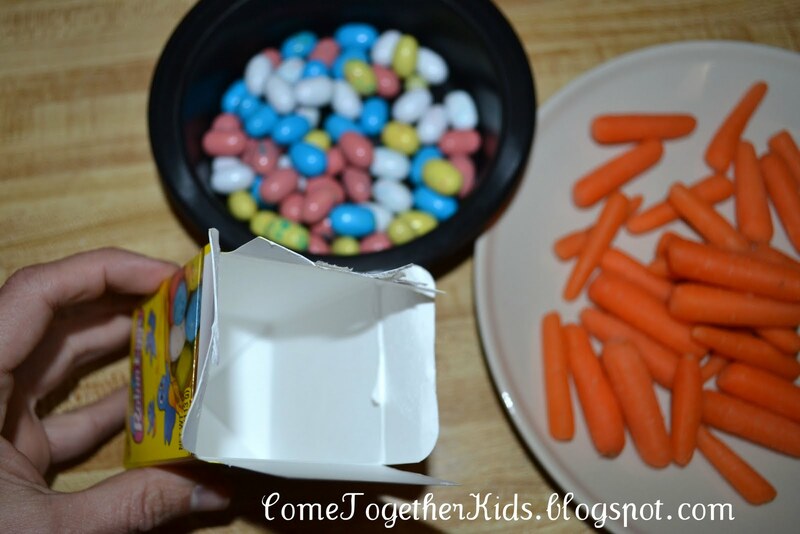 Fill the carton about halfway with baby carrots, fold over the flaps and hot glue back in place. I think the kids will be really surprised. The carrots rattle around and sound just like the chocolate malted eggs and both the top and the bottom of the carton still look untouched. 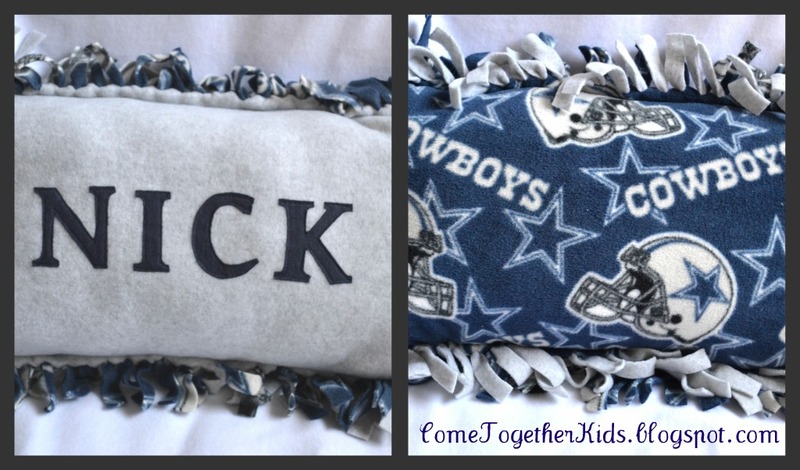 The front and back of the personalized Cowboys pillow. Two pieces of coordinating fleece, each approx. 19"x25"
** NOTE ** Because the first few steps of this pillow are identical to those in the Personalized Pillow Kit, you can check out that tutorial HERE if you'd like visuals for the steps. 1. Trace the letters for the name onto the paper side of the Iron-on Adhesive. (You'll want to flip the letters over backwards when tracing so the letters face the right way when you cut them out.) Following the directions on the package, iron the Heat n Bond to the wrong side of your fabric for the letters. Cut out the letters for the name. 2. Carefully iron the letters onto the fleece. (You'll want to be very careful not to leave the iron in one spot for more than a couple seconds or it will melt a mark into the fleece!!) Then machine stitch around the letters to more securely attach them. 3. Using a marking pencil and a ruler, draw lines 3 1/2" in from each of the edges on one of your fleece panels. * Here is where the directions change for this different style of pillow. 4. Keeping the wrong sides together and using the lines as a guide, sew around the outside of the pillow, leaving an opening to insert the stuffing. Sewn around 3 1/2 inches from the outside with an opening for stuffing. 5. Stuff your pillow then sew closed the opening. 6. Cut squares off of each of the corners. 7. Cut a 1/2" fringe around the perimeter of the pillow, being careful not to cut into the seam. Then tie each pair of strips to help "mix" the colors of the two panels. 8. That's it! Your personalized pillow is complete. 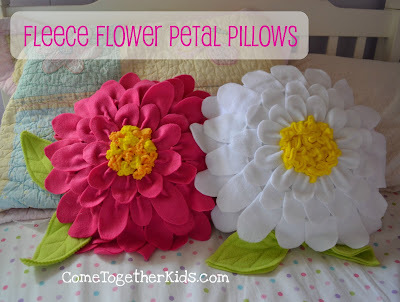 I think this is an awesome, yet inexpensive, gift or a great way to add a little color to your couch or bed. With all the teams and other patterns available in fleece, you really have a ton of possibilities. My son was invited to five, yes five, birthday parties in less than a month. I knew if he wanted to attend all of them, we'd have to get creative for gifts to stay within our budget. 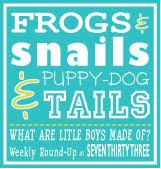 Plus, I think personalized gifts for the birthday child can be even more fun than a little toy that will quickly lose its appeal. Since we all know I love working with fleece (see HERE and HERE and HERE and HERE), I decided to go with personalized pillows for the gifts. Each one I did slightly differently, I'll show you the first "style" here now and then show the others later. (Think of this as the first in a three part series! ;) ) The great thing about this gift is that a sewing machine is not required!! My son is a big sports fan and loves to talk sports with his little friends. 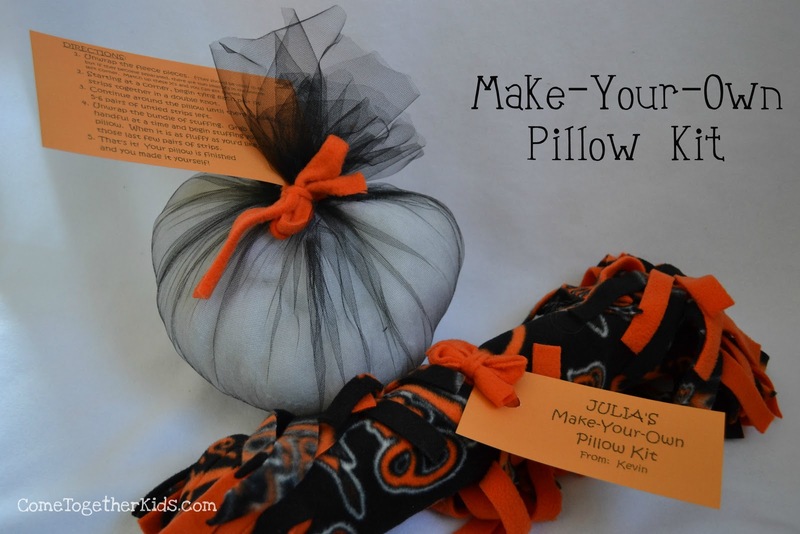 For the first pillow gift, I made a Make-Your-Own Pillow Kit for his friend, Julia. They played on the same tee-ball team last year and I knew she liked the Baltimore Orioles, so we thought this would be perfect. ( NOTE: The machine appliqueing is totally optional. Draw your guidelines 3.5" inches from the edges. 4. Using the lines as a guide, cut a 1/2" fringe around the perimeter of your pillow. I cut the extra pieces off at the corners so they wouldn't be too bulky when tied. Fringe is cute and edges are notched. 5. Next, I used a fabric paint pen to mark two X's on one pair of strips. This way, if the two panels become separated before the child starts the project, they can match them up easily. Pillow panels are ready to go. 6. Pull out handfuls of the fiberfill stuffing to be used to stuff the pillow. I just laid it on top to get an estimate of how much I'd need, then added a few more handfuls to be safe. 7. Lay the stuffing on your piece of tulle. Smush it down as you're tying it up to get a nice, compact bundle of stuffing. Tie it up with a scrap of your fleece. Then roll up your fleece panels, and also tie them with a scrap of fleece. 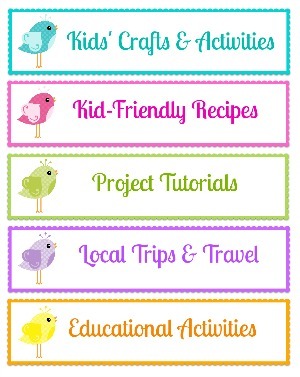 Add a little tag and directions and your gift is ready to be put in a gift bag and taken to the party! Want an idea of what the finished product will look like? Here's another pillow we made that was ready-to-go. ** NOTE ** I'm happy to report that the recipient loved her pillow kit!! Earlier in the week, I came across this Taco Bowl recipe from Amy at A Little Nosh and immediately bookmarked it in my "Things to try SOON" folder. It had everything I look for in a dinner recipe ~ it was quick and easy to make, with ingredients that I usually have on hand ~ plus the edible bowl idea was really clever. Since I was planning on making tacos one night this week anyway, I decided to alter the menu just slightly and make these instead. I made a few changes to the recipe Amy posted based on what I had in the fridge and pantry. They were easy to prepare, tasty and will definitely be added into our meal rotation. UPDATE: Like sweet more than savory? Check out the dessert version I just came up with ~ Cinnamon Dessert Bowls! How fun is this for dinner? Microwaving the tortillas to soften is a necessary step to get them into the muffin tins easily. 3. Bake the empty tortilla shells for 10 minutes. Meanwhile, brown the ground beef in a large skillet with the taco seasoning and about 1/4 cup water. Add the corn and black beans and simmer until everything is heated through. 4. 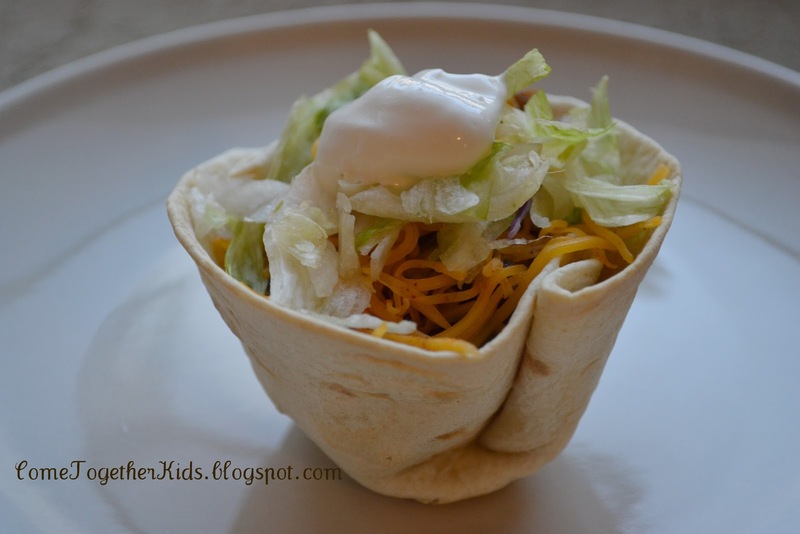 Spoon the meat mixture into your tortilla cup. Add your choice of toppings and enjoy. We liked scooping out a few bites with a spoon or fork, then picking up the whole taco bowl and eating the rest! A couple of months ago, I came across this AWESOME idea for a Chocolate Emergency Valentine at Making Memories with Your Kids. I absolutely loved the concept (and her whole blog full of great ideas), but I didn't have time to make them for Valentine's Day. I bookmarked it for next year and then realized, I don't have to wait that long! It will make the perfect April Fools' prank for my kids. 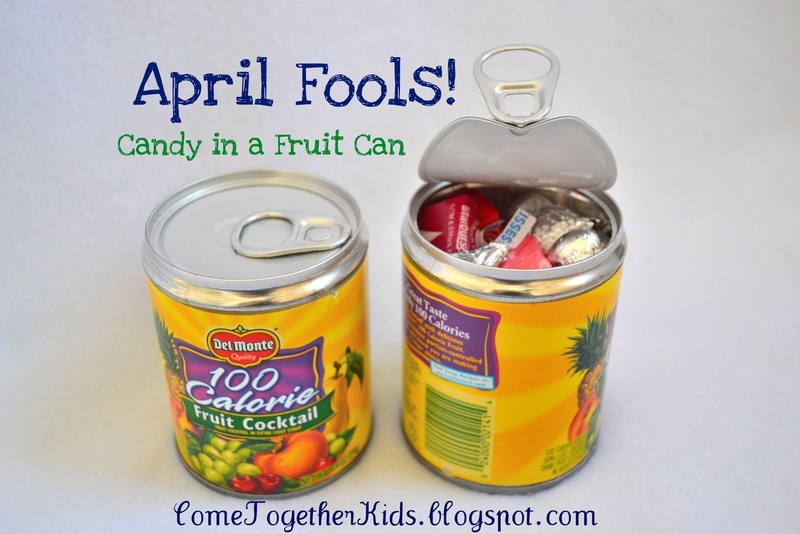 It looks like a sealed can of fruit, but it's filled with candy!! I cannot wait to fool my kids on April 1st! Plus, it was really simple to make. LAST MINUTE UPDATE: I added a more nutritious prank to their lunchboxes to go along with this one. Check out Carrots in a Candy Box HERE! 1. Use your can opener to open the BOTTOM of the can of fruit. If you are using a regular can opener, don't cut around all the way. Leave about 1/2 " - 1" intact. If you have one of the handy can openers that removes the whole lid without sharp edges, you can cut all the way around. Notice I left part of the lid intact. 2. Empty out the fruit. (Save it so they can have a healthier snack after they eat all their candy!) Rinse out your can and dry the insides. They will still have to eat the fruit, just not today! 3. Fill the clean, empty can with your candies, then put in some tissue paper so the contents don't shake around and give away the surprise. I wrote a little note and put it in first. 4. Using hot glue, seal up the bottom of your can. It's not perfect, but they really won't be looking at the bottom. 5. Try not to giggle when you pack it in their lunch or serve it for a snack. Confession time. We used to have a cute little holder to put lost teeth in for the Tooth Fairy, but somehow lost it in the clutter and confusion of our busy house. The last few lost teeth got stuck in a ziploc bag and put under their pillows. The kids didn't really seem to mind (as long as they still got their dollar! ), but it bothered me that I never got around to finding a cute replacement. Last week, my son told me his front tooth was getting loose and he's been wiggling it like crazy to speed up the process. This afternoon, I got to work and made a special Tooth Fairy pillow just for him. Because he's a big, cool seven-year old, I didn't want something too childish or cutesy. I also wanted something that could hang on the doorknob, so the Tooth Fairy could visit without having her cover blown! 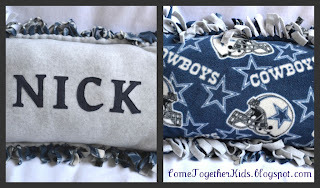 ;) He's a big sports fan, so I used a football fabric I had in my stash. 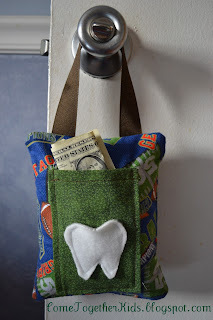 I made two pockets ~ a little tooth shaped one to hold the lost tooth and a larger pocket to hold the money. It didn't take long at all and he loved it! 1. On your coordinating fabric for the money pocket, fold over each side 1/4", iron, then fold over another 1/4" and iron again. On one of the short ends, top stitch across the folded fabric. This will be the top, open end of your pocket. Edges folded and pressed, top edge sewn. 2. Pin your tooth shape to the front of the money pocket. Sew around the sides and bottom edges of the tooth, leaving the top open. Fleece tooth pocket is ready for a real tooth! 3. Pin your money pocket to the right side of one of your pillow pieces. Sew down the sides and across the bottom, leaving the finished edge open at the top. Money pocket pinned to the pillow piece. Stitch around the edges. I followed the edge of my machine foot. 4. Pin your ribbon to the top edge of the right side of one of the pillow pieces. This is just one piece of ribbon, I just didn't get the whole thing in the picture! 5. Pin your two pillow pieces right sides together, making sure that your loop of ribbon is not near the edges. Sew around the edges, leaving about a 4" opening along the bottom edge to turn your pillow right side out. Where the ribbons were pinned to the edge, I stitched, reversed, then stitched again to make sure they were securely attached. 6. Trim your corners, then turn your pillow right side out. Stuff your pillow, then top stitch along the bottom edge to close up the opening. Stuff, then stitch the opening closed! Your new Tooth Fairy pillow is all ready for the next lost tooth! QUESTION: Is anyone else as grossed out by loose teeth as I am? I shudder every time I see a little tooth barely hanging on. Seriously, though, can you blame me?! Fleece is inexpensive, comes in tons of different colors and patterns, is soft and cozy, and doesn't fray or require hemming/finishing of edges. 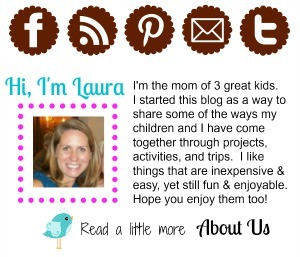 So far, I've used it to make Fleece Boa scarves, a cute Reverse Applique scarf and a No-Sew Fleece Pillow. My only problem with this fleece obsession is that I've found myself "collecting" it. I'll find remnants at the fabric store for next to nothing and I just can't pass it up. Plus, I have lots of good sized scraps here at home left over from all my projects. I recently started working on re-organizing my craft room and filled several large plastic bins with fleece yardage and remnants. Now that winter scarf season is over, I knew I had to come up with another fun way to use one of my favorite fabrics. Aren't they a cheery little addition to the bed? Fleece (1/2 yard in the color of your flower, plus some coordinating scraps for the center and leaves) You could also use felt, but I think fleece is softer! 1. Cut two circles out of your fleece. The size is up to you. I traced a large bowl and my circles were about 14". Sew (or hot glue) around the edges, leaving an opening for stuffing. Next, using a piece of chalk or marking pen, trace a smaller circle for the center of your flower and three additional rings to make a bullseye design. ( I somehow missed the picture of the completed bullseye, but you can get the idea). These guidelines will help you place your petals. 3. Add stuffing to your pillow and stitch (or glue) closed the opening. I then used pinking shears to trim the edges of the pillow and leaves to make it a little more decorative (optional). 4. Using hot glue, attach the leaves to the edge of your pillow. The edges are "pinked" and the leaves are attached. I actually cut out and used a lot more, probably 50-60 or so. 6. Starting on the outer ring of the bullseye you traced, start gluing down your petals. I found it worked best to put a line of glue along the bottom of the petal, pinching the center to give it a little dimension, then attaching it. A line of hot glue. Pinching the center to give the petal dimension. Attaching the outer row of petals. 7. Once the outer row is complete, start working on the next ring of petals. I added an additional drop of hot glue to each petal to help hold it down and cover the line where the first ring of petals were attached. Use an additional drop of glue on the inner rings of petals. Working on the next row of petals. 8. Keep adding petals until your flower is complete. I used the larger petals for the outer two rows, a mix of large and small for the next row, and all small petals for the inner row. My circles. They don't have to be cut precisely. "Ruffle-ing the circles and attaching them to form the flower's center. And you're finished! Isn't it pretty? Super Easy "S'mores" on the Go!